RALEIGH, N.C. (April 11) – As a standout running back at Saint Augustine’s University and later with the NFL’s Baltimore Ravens, Walter Sanders used his shifty moves to avoid blows from would-be tacklers. Sanders, a Baltimore native, is now dishing out blows as a light heavyweight boxer. Since trading his shoulder pads and helmet for boxing gloves, Sanders is considered one of the top U.S. amateur fighters in his new career. He is already the Maryland Light Heavyweight Novice Champion despite boxing less than two years. In one fight, Sanders, one of the hardest hitters in the D.C.-Maryland-Virginia region, defended his crown by knocking out an opponent in 20 seconds. Last Saturday, April 6, Sanders raised eyebrows when he captured the Washington, D.C., Golden Gloves championship. Currently 7-0 with four knockouts, Sanders, nicknamed “Stone” because of his punching power, fights again in the Golden Gloves Regionals in Fort Washington, Md., on April 27. 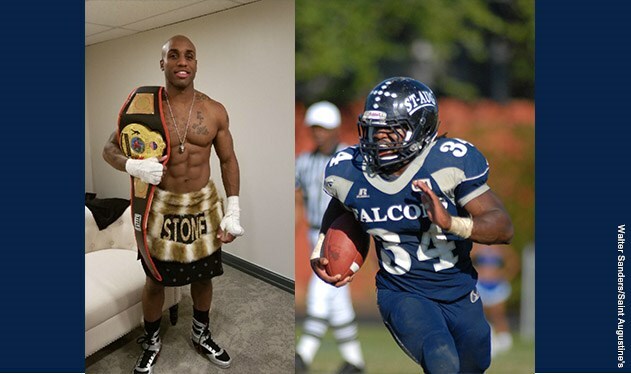 Before becoming an NFL player and later a boxer, Sanders was a star running back at then-Saint Augustine’s College from 2007 to 2010. Sanders was named CIAA Conference Offensive Player of the Year in 2010 after rushing for 1,377 yards and 15 touchdowns on a Falcons’ squad that won the Pioneer Bowl. Sanders still holds the modern school record for season and single-game rushing yards (262), and he was the career rushing leader (2,747 yards) until 2015. Sanders is currently second on the school career rushing list, and his 27 career rushing TDs are a modern school record. A 2011 Saint Augustine’s graduate, Sanders works as a Baltimore County firefighter when he is not training. He has worked out with Emmanuel Taylor, who is well known in boxing circles. Taylor fought Adrien Broner in 2014. Sanders plans to turn pro in 2020.